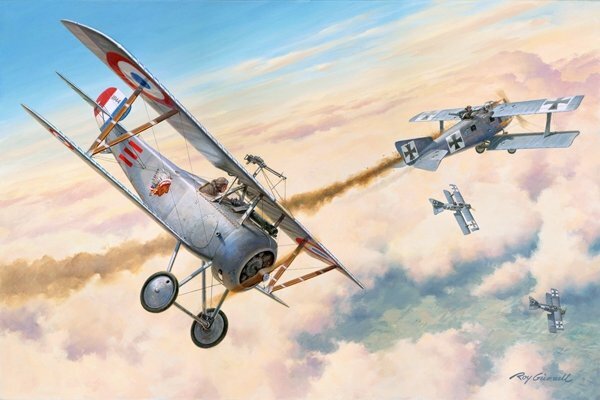 Raoul Lufbery’s life ended on 19 May, 1918 in a tragic combat death. Lufbery is enshrined and honored along with 200 other American Volunteers of the Escadrille Lafayette, in a beautiful park at Villeneuve L'Etang outside Paris, near Versailles. It is called the Memorial de l'Escardille Lafayette." The painting has been reviewed and approved by the family of Raoul Lufbery. This special edition of "First American Ace" is signed by a minimum of 26 American aces, and in some cases, it has up to 30 signatures. This print depicting the fifth victory of Raul Lufbery, was signed at the American Fighter Aces reunion in San Antonio earlier this year. Don't miss this chance to own a rare piece of American history. Hand signed by Ace 26 – 30 Aces and artist Roy Grinnell. The overall size of this lithograph is 24" x 30".